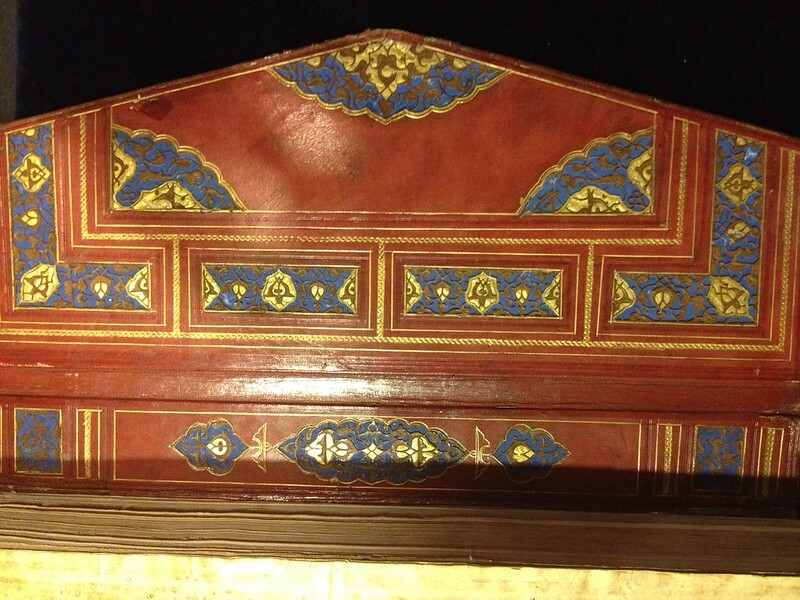 This entry was posted in book, bookbinding, sca and tagged bookbinding, books, embellishment, mamluk, mughal, tooling. Bookmark the permalink. If you went for full historical accuracy you did swell by doing it with shell (that’s why I suggested the painting tip after all!) but if you simply wanted something that imitates the period’s bindings then gold tooling would make for a good practice! Great links by the way, thanks for sharing! Also, thanks a lot for the kind words on my blog! Keep up the good work and them pictures coming! Ah, yes, Eastern bindings. Damn they’re beautiful! But it’s so hard to find archived photos of them. Have only seen very few up close and never had the chance to handle any (sigh…). 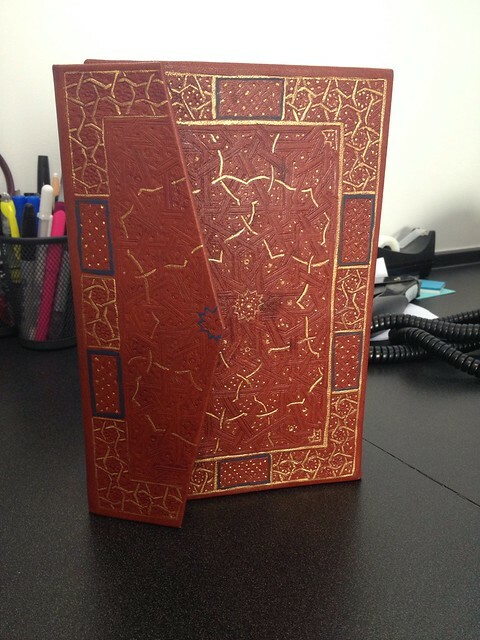 Your Mamluk binding looks great! Maybe share some pics from the inside as well? May I offer one small piece of advice? Hold in place some waste sheets of paper on both sides of the blind tooled lines before your paint them, that would give some crisply straight results! I didn’t do tooled gold on this cover because all the extant bookbinding manuals, plus all the conservators’ notes on the extant pieces I’ve been examining are very explicit about the gold being painted shell gold. I will eventually learn how to do gold tooling, but in this instance it’s not something that is internally consistent with the materials and techniques of these bindings. I’m planning to post more photos soon! I had them archived in a separate place from where I made this post, but do intend to share. I didn’t illuminate the interior but blind-stamped the leather for the doublures. It’s out of print and therefore very costly to purchase, but can be obtained/borrowed through the interlibrary loan system. He includes a number of Mamluk bindings from the 13th-16th centuries, plus an informative section at the beginning of the book on medieval Islamic binding practices, along with translated excerpts from a couple of medieval binding manuals. Thanks so much for reading and commenting! I’ll be sure to keep posting things as I make them! 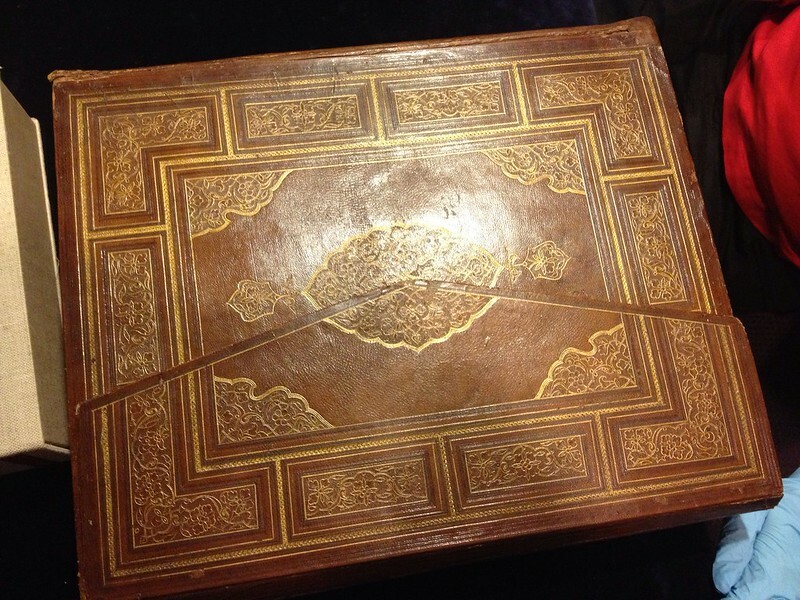 And I got a chance to look at your bindings, too, which are pretty incredible. You are clearly a very accomplished professional, and I can only hope to get my craft as fine as yours! Definitely going to be bookmarking your blog for future tool source/inspiration purposes.